For all the intrigue of the last two weeks, the question of who leads Astana—and the Tour de France—came down to the simple matter of who can ride up a mountain faster. Alberto Contador gave us the answer yesterday on the first Alpine stage of the Tour. As the New York Times reports, Armstrong will not challenge Contador, saying, "As far as I’m concerned, I’m happy to be a domestique." He at once too modest and too proud. 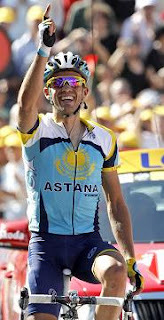 Lance Armstrong is not a domestique; he stands second in the general classification. As for not challenging his teammate, Armstrong is graciously agreeing to not do what he can't do. One might as well challenge the laws of gravity, from which Contador alone stands aloof. He rode away from his rivals like he was dancing on a high wire.